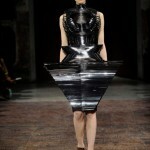 These runway designs are distinctive and futuristic. 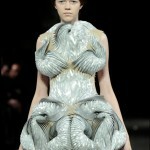 In July 2011 Iris van Herpen has inspired us in a partnership between Mercedes-Benz and ELLE already in Berlin with their equally extraordinary and distinctive designs. With anticipation we have now in her Paris Frühjahr-/Sommer-Defilée expected. 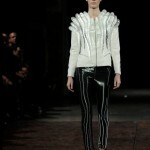 And she has outdone himself: to the sophisticated creations of metal fibers, polyamide powder & Co., we see this time elaborate leather-look in Olive Buckle, cape-like garments with unparalleled gloss, coated leather in combination with plastic peplum and seams, metal bands be processed into triangular or bent clothes artfully … Wow, these designs are evidence of the highest art of tailoring and fashion visionary understanding of the Dutch. 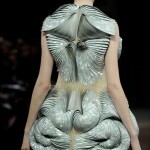 No wonder that Iris van Herpen is considered a shooting star in the industry. From her we will be hearing a lot (and see! ).